“Thanks, Einstein. That doesn’t help.” My husband sighs at my rudeness and sagely decides not to challenge it. He knows I am stressed because I feel unable to fix a problem, one that involves harming a living thing. “Just give her a little more time and let her get used to where she is,” he said simply. We gave her the rest of the night and the whole next day and night. By the second morning, we admitted defeat. The guinea just wouldn’t sit on her eggs. When we let her out, she ran to her old nest and didn’t look back at the eggs that she had already sat on for nearly three weeks. We’d moved them because she chose to nest out in a field that had absolutely no protection whatsoever. We were very surprised that she hadn’t become fox fodder already. Our guinea reference book advised moving them when creating protection around her was not possible. We followed the book, and it just didn’t work. Because the eggs were so close to their due date, and she had been off them for such a long time, I thought they were dead. My husband said to chuck them, but I just couldn’t bring myself to do it. I put them back in the field in her original nest, thinking that at least some animal would get use from them. About a week later, 18 guineas hatched out. It was a homesteading miracle. The story doesn’t end there, but in order to tell it right I have to go back to where it all began. It began in our vegetable garden. Our garden has always been a source of joy and sustenance to my husband and me. It has never been a show garden, but one critical to our food supply. The joy came in the great and delicious bounty that our efforts brought. We also prided ourselves that we could have an excellent garden without the use of noxious chemical pesticides. A particular source of gratification was our squash and zucchini patch; we managed to grow astoundingly large plants. While our neighbors could only manage to grow plants that could reach up to my knees, at best, our plants grew to reach my waist. The leaves of our plants were the size of dinner plates. The few plants we grew produced in such vast quantities that we experienced squash and zucchini overload. By midseason I could no longer find anyone that would take them willingly, and I had to compost them. This state of squash and zucchini nirvana lasted two or three seasons; then, a great evil came to our garden: squash bugs. At first I could hand pick them. I’d spend time every morning dispatching squash bugs. Soon I found that my quickest and easiest method was using duct tape. Squash bugs lay eggs in clusters usually on the underside of the leaf. By pushing the tape up against the leaf, I could get most of the eggs to come off easily. If there had been a hatch of squash bugs, I could catch them all at one time just by slapping the leaf against the duct tape. Adults would end up stuck onto my strip of tape as well. Daily duct-tape raids worked well for a couple of years. Then my husband and I had our first child, and time in the garden was greatly reduced. As a result, my squash-bug-eradication program experienced drastic cutbacks. I simply could not keep pace with the bugs’ reproductive prowess. Our plants became infested and died without producing much at all. It was a source of great dismay. For several seasons we limped along trying to figure how to deal with the problem in the time we had without resorting to conventional chemical warfare. We found no method that brought us back to the pre-squash bug success we had before. Then light dawned in the form of a magazine article. A popular magazine, to which we subscribed, suggested the use of guineas to control squash bug populations. I became excited. Not only would the guineas take care of the squash bugs, you could also get eggs from them too! This was a perfect solution. I did a little more internet research and found a couple more articles supporting the idea that guineas would help with squash bugs. I asked my extension agent about the idea. He agreed that guineas were one of the more carnivorous fowls you could raise but remained silent about their efficacy with squash bugs. At that point I knew it would work out and I became determined to make it happen. After much leg-work and searching I was finally able to pick up four baby guineas, also known as keets. They were cute, and we were enamored. 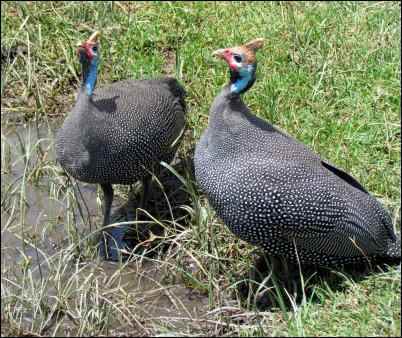 My two year old son named the white one Lavender, because white guineas are known as lavender guineas. He named two more Dixxon and Clickson, after Santa’s goldfish (I wasn’t aware that Santa had goldfish, but my son assured me Santa did, and that their names were Dixxon and Clickson). The last one he dubbed Sarah. These keets were not just livestock. They were going to be an integral part of our self reliant existence, so they deserved distinct names. Our journey with guineas had begun. I obtained a guinea reference book. It was the only resource on guineas I could find in book form. I began reading and quickly came up with the plans that would suit us according to the book. I was excited. 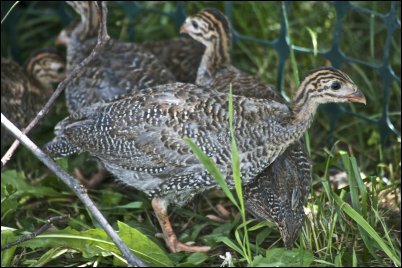 The author had nothing but praises for her guineas, and she provided information on all aspects of raising and caring for them. As the babies matured in a cage in our cabin, my husband and I began work on their coop. Rejected scrap lumber from a local saw mill, screws, some plywood, a neighbor’s discarded posts, scavenged wheels from old lawn mowers we’d recycled, and part of an old ladder that was falling apart produced a very decent, awkwardly mobile, guinea housing-unit. Seeing the end product was satisfying, and making it together was fun. It had all that the book said guineas would need. I knew they would love it. Then we had to make a guinea pen around our squash plants. According to the original magazine article that I read, in order for this plan to work, the guineas were supposed to be sequestered around our squash plants and unable to go anywhere else to get bugs. We designed and built a pen mostly from scrap material that met our needs according to the book and the magazine article. It stretched around three raised beds that held our squash plants. It also encompassed part of our grassy yard so that the guineas had more than enough room to be comfortable and healthy. We transferred the guineas to the coop. By this time they were old enough to be outside and treated as adults. As suggested by the book, we let them have a few days shut inside so that they would come to view this coop as their home and go inside it every night to roost for safety. Everything was going according to plan. Then one day my husband found me staring at them in a worried state. “What’s wrong, Sweetie,” he asked. “They’re not going in their coop. They’re huddling down and sleeping on the ground. The book said they’re supposed to sleep in their coop. I tried luring them in with food, and also leaving them in for a couple of days to remind them that’s where they belong, just like the book said. But they’re not getting it,” I replied. “Well, they’re fenced in. It should be ok,” he said. By the end of the gardening season they still hadn’t started eating the squash bugs or sleeping in the coop even though I followed instructions from both the book and magazine articles concerning these issues. We decided that it would be better next season when they were older. When autumn came and bugs became scarce, we began letting them out of the pen so that they would be able to forage better. They did come back to the pen to hide around the raised beds most nights. Sometimes, however, they would set up camp on the ground in the yard outside of their pen, and a nighttime guinea-catching party ensued. Catching guineas in the dark was not fun. It was frustrating, but the book warned about nighttime predation, and we knew it was right. So we endeavored to catch them and put them inside the coop. By spring, despite our efforts to protect them, we had lost Clickson and Lavender to predators. I did not despair yet. 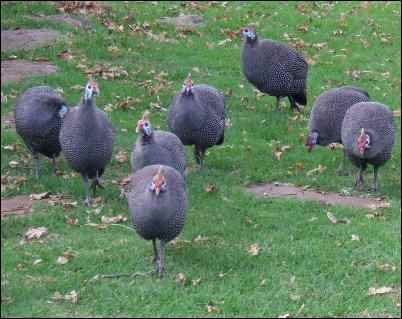 The growing season was soon to be upon us and we still had two guineas left. We would begin the squash-bug-eradication program anew, and this time it would work. I began preparing my garden for the growing season. While working in the garden I often crouched down to work in a raised bed. One time while in this position, I was suddenly attacked from behind. Wheeling around in anger I found Dixxon strutting back and forth, charging at me and then backing away. He had jumped on me. I shooed him away and resumed working. I didn’t think anything about it. It happened a couple more times when no one was around to witness it. I was becoming cautious about leaving my backside exposed to Dixxon. I consulted the book, but it said nothing about this kind of behavior. Then one day my husband saw an attack and started chuckling. “Hey, it’s not funny,” I fumed. “Yes. At any rate, I don’t think it will last long,” he said. My husband grew up on a farm. Although this was his first experience with guineas, he was pretty confident about his assessment of the situation. He was right. Soon Dixxon stopped attacking me and began standing guard over Sarah who had begun to nest in the coop. Our newly planted squash and zucchini plants lay nestled in their raised beds inside the guinea pen, too young to be of interest to the squash bugs. Time passed as we awaited the coming of the new keets, confident that they would be the answer to the squash bug problem. I began consulting the book again to prepare for the new keets, and on the day the first one hatched I found a problem, a serious one. Sarah had been nesting in a recycled dresser drawer that was very deep. There was no way her babies could get water and return to the nest. Sarah could not get off her eggs to keep the babies outside the drawer warm. I made the decision to remove the keets and raise them in the cabin as I had done before. I waited a whole day for the guineas to hatch. The book said her eggs would hatch within a day. Sarah only had two of her almost twenty-five eggs hatch. So much for Dixxon’s reproductive prowess, I thought; he could use some pointers from those darn squash bugs. When I felt the babies could no longer go without water, I went in and got them. The next morning there were two more. I retrieved those. Over the next five days Sarah continued to hatch 17 keets in all. I worried that this wasn’t normal. I went to the book. It had nothing for me. I asked a farmer friend. She was unconcerned; the keets were healthy. When the keets were large enough to live outside, we introduced them to the coop following the procedure laid out in the book. When it was time, we let them into the guinea pen giddy with the anticipation that they would eat up the dreaded squash bugs. After a few days, even though the pen had plenty of room for them, they began to trample the squash and zucchini plants. I watched Dixxon actively attack some of the very plants he was supposed to protect. He wasn’t going after bugs. He was just pulling the leaves off the plants. Our squash-bug-eradication program using guineas was at an end. We would have to find another way. Even though the guineas did not fulfill the function for which we got them, they did keep down bug populations around the cabin. They also had the added benefit of not scratching up the garden. We decided to keep them, but we let them co-exist with us on their own terms. We decided to cut the flock in half, and gave a number of the young guineas to a friend that was ecstatic to get them. She had once had a horrible flea problem in her yard, and guineas had taken care of them. Her original flock died out. She welcomed ours with open arms. Life with guineas continued. Then late in the summer, I noticed that, although Sarah was coming back to the pen every night, I didn’t notice her with the rest of the flock during the day. One morning when I left the guineas in the pen later than usual, Sarah was frantically pacing back and forth in front of the door waiting to get out. When I let her out she made a beeline into the field. She was nesting. I didn’t concern myself at first, she was coming home every night. I decided that she knew best. Then one night she didn’t come back. The next morning I checked her new nest. She was still alive. We were unable to protect the nesting site because she laid it just inside the edge of a huge brush pile. We fretted for a while, and then I consulted the book. That was when we tried to move them. 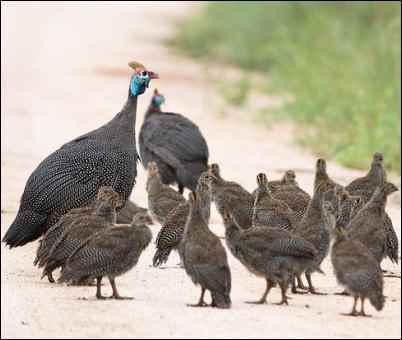 After Sarah hatched those 18 guineas, I finally decided to put the book aside and let nature take its course. We tried to protect Sarah and her babies the best we could. She would not bring them to the pen, and predation was still a great concern as she nested in the field. She resented our attentions, and one evening took her new keets to a new nesting spot that we could not locate. The next morning I walked outside to hear a loud squawking from Dixxon and several loud peeps. I went over to the pen. Dixxon stood squawking in agitation, a keet huddling near him. I listened intently. I heard a number of peeps all around me and out in the field. I honed in on one and found a keet by itself in the garden. I put it in my shirt pocket, summoned my family and began rounding up the keets that we could find. We only found six. We also found Sarah’s feathers spread around the field. From the time that I took his first set of keets out of Sarah’s nest my relationship with Dixxon had become adversarial. He had come after me a number of times, when he thought I wasn’t looking. In return, I chased and threatened him. Our encounters were pretty epic. So when I returned to the pen to retrieve the keet that Dixxon had found, I expected a battle. I entered the pen and sized up the situation. He had found another keet. Both keets were in apparent distress huddling around his legs. He looked at me head on. I prepared myself for an attack. Then I watched in utter amazement as Dixxon tried to do what no male guinea was ever programmed to do. He fluffed his feathers and gingerly squatted down to warm his keets. My disdain for Dixxon, borne out of our adversarial relationship, melted and was replaced with great respect. I left the keets with him for the time being but retrieved them later when Dixxon could no longer maintain a behavior that was against his nature. After a couple of seasons, our flock of guineas died out and I gave my guinea book to the local library. I learned a lot from my experience. It was a lesson in patience, problem-solving, and innovation. I realized, that most reference guides are only suggestions, at best. No book or magazine has all the answers for every situation. I also learned that even though I like to try to solve problems in a proactive way, sometimes I have to accept that a resolution to a problem may mean simply letting go. This is because learning when to let nature take its course and when to interfere is a great balancing act with no guarantees for success. Most importantly, I learned to forgive myself when my plans and solutions don’t work out because every failure is truly an opportunity for learning and improvement.